The bug on top has its molted exoskeleton stuck on its body. It molted first: notice its darker brown coloration. Bug on bottom just recently molted: notice its paler, lighter coloration. 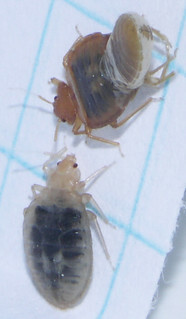 Both bugs have blood from previous (5th instar nymph) stage still in their digestive tracts. Molting occurs when bug is physiologically ready. It doesn't have to totally digest its current blood meal first. Newly molted adult females may be able to produce eggs and mate before their first adult blood meal. 1/4 inch squares.